Are you ready to locate the perfect Cypress Financing for Air Conditioning services for your specific needs? Perhaps you’re trying to find the right repairs, replacements, and inspections your systems need, but you don’t know how. While this can seem like a lot to ask and expect out of a business, you’ll be able to succeed with our team around. 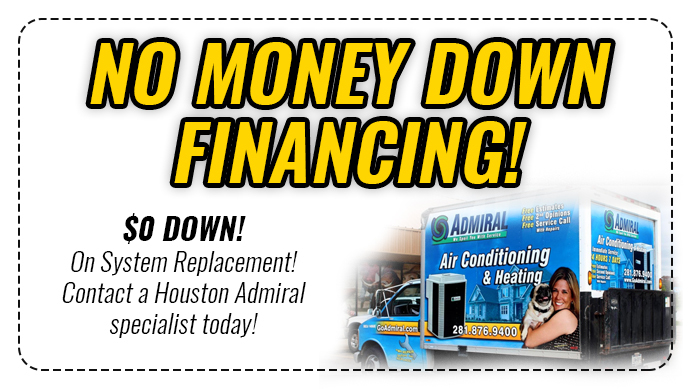 With the assistance of Houston Admiral Services, you’ll never have to worry about your Cypress air conditioning ever again. Take advantage of the FTL Financial Lease options we have for you. Are you ready to discover new ways to afford the right air conditioning units? Perhaps you’re trying to figure out how you can get a new system without spending thousands upon thousands out of pocket. This is something that can really be scary for the typical Texan, and it’s never something you should be afraid of. To make sure you have the right resources for a foreseeable future, count on our team to provide you with timely assistance. The FTL Financial Lease we offer is absolutely critical for you if you want to find a system you can afford without having to pay for it all at once. As a single installation loan with only a $1 buyout, you will be able to keep up with your payments without sinking your entire budget. As a Houstonian, you need to make sure your cooling options are covered before it’s too late. Take pride in your systems and give them the attention they deserve by investing in our FTL Financial Leases. Call us at 281-876-9400 to learn more about your options. As you can probably already tell, the Cypress Financing For Air Conditioning options we have can be confusing to the typical Texan. Are you trying to figure out more details about what we have to offer, but you don’t know how you’re going to find more info? While this can be very tricky and confusing at times, our professionals are here to help you. Reach out our team and make the most out of your situation by calling us at 281-876-9400. Houston Admiral Services has some of the best inspection plans you will find on the market today. Are you ready to start taking a deeper look at the appliances you’re currently using? This is something that can really be tough for the typical Texan, and we understand your frustration when it happens. Make sure you’re able to overcome these troubles by counting on our technicians. Our NATE-certified group of specialists can provide you with a detailed 31-point inspection that will absolutely blow your socks off. You deserve to have the right capabilities, and you also want to make sure you succeed even when things don’t go your way. If you’re prepared to invest in your machinery and ge the most out of your air conditioners and heaters, Houston Admiral Services is here to help. Enlist in our plan and make sure you’re able to save time and money with the help of our technicians. We have decades of experience working with air conditioners, and we’ll make sure your unit’s lifespan is maximized. Our team cares about providing you with the right help whenever you’re in need of a hand. 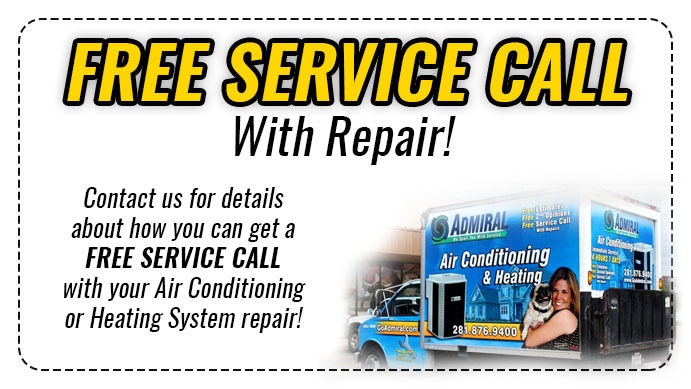 Make the right call and change your life by calling Houston Admiral Services at 281-876-9400. Are you really worrying about how much you’re going to end up paying once everything is said and done? If you’re trying to work within a specific budget, you may feel like you’re out of touch with what’s going on in the industry of air conditioning and heating. People truly struggle with this when they’re unsure of how these appliances work. If you’d like more information on how we can save you money, we have technicians and experts standing by who are ready to help. Reach out to these experts and make the most out of your setup; you won’t regret working with our Houston TX HVAC experts. Houston Admiral Services prides ourselves on making sure our customers get everything they want out of our many services. If you’re trying to figure out what it’s going to take to make sure you have the right savings and discounts for what matters most to you, we can help. Check into our business and see what you can do better towards savings cash on the most important services. Our admirals are standing by, and they’re ready to help you with your struggles. For more information, don’t hesitate to continue reading our website and checking to the various landing pages we’ve set up for prospective customers. You can also give us a call at 281-876-9400 to learn more about what we have to offer you. Our Cypress Financing For Air Conditioning services are absolutely perfect if you’re trying to figure out what needs to happen with your systems. Heating and cooling needs are very sensitive, and you’re going to need someone on your side before you start developing your blueprint for success. Make sure you’re able to take advantage of what’s going on with AC and heaters by calling us at 281-876-9400. Our team of professionals are here to provide you with timely assistance for affordable prices. Cypress is a small community located ery lose nearby Houston. There are many award-winning schools in our public school district. If you’ve been trying to find a way for your child to learn music and onew things, this is a great place to be. Many of our residents have moved here solely because of the cleanliness and atmosphere of our vibe.